The Bee Gees became the first act to occupy the top 2 positions for 2 weeks running as ‘Stayin’ Alive’ spent a second week at 1 and ‘How Deep Is Your Love’ was unmoved at 2. The previous chart topper, Wings’ ‘Mull Of Kintyre’ was unmoved at 3, but the top 3 were threatened by Kelly Marie’s ‘Make Love To Me’ which was one of 2 climber of the weeks with an 8 place jump from 12 to 4. The other climber was Linda Ronstadt’s ‘Take It Easy’ which moved up 8 from 14 to 6. This was the 4th time we had seen 2 songs by solo female artists take the climber of the week in the same week. Eruption’s ‘I Can’t Stand The Rain’ was the only other star rather this week with a 4 place climb from 19 to 15. Falling honours went to Bonnie Tyler’s ‘It’s A Heartache’ which dropped 6 from 18 to 14 and was only her second time with the award. ‘Mull Of Kintyre’ and Clout’s ‘Substitute’ were still the oldest on the charts, both songs having amassed 18 weeks. This was their 6th week as the oldest. Both songs also both moved past the 300 points mark and were the 30th and 31st songs to manage this. ‘Substitute’ was the 10th local song to reach this landmark while ‘Mull of Kintyre’ was, surprisingly, only the 3rd by a British act to do so. There had been 13 by American acts, 2 by German acts and 1 each by Dutch, Canadian and Greek acts. Wings also saw their total points move past the 700 mark. They sat on 716 which placed them 35th overall. Bubbley’s ‘Valentino’ was the first of 2 songs to depart the chart. It lasted 10 weeks in the top 20 and peaked at 11. This was the end of the road chartwise for Bubbley who were also known as Champagne. They had managed 2 hits, spent 21 weeks in total in the charts and their other hit, ‘Oh Me, Oh My Goodbye’ had their best peak of 5. Also going was Smokie’s Needles And Pins’. It had managed 12 weeks and peaked at 3. So far, Smokie had managed 5 hits, all of which had gone top 5, but none had managed to top the charts. A bit of a spoiler alert, but Smokie would be only 1 of 2 acts to have at least 5 top 5 hits and no number 1. The only other act to manage this many top 5 hits and no number 1 was Donovan. Smokie would have more hits chart. With the first of the new entries being The Bee Gees ‘Night Fever’, we saw only the 8th week where an act had 3 songs in the top 20. Four Jacks & A Jill and Percy Sledge had both managed 3 such weeks, while Pussycat had managed 1. As with The Bee Gees’ other 2 hits in the charts at the moment, ‘Night Fever’ was also from the ‘Saturday Night Fever’ soundtrack. The Bee Gees became the first act to see 4 different combinations of songs in the chart at the same time. ‘Night Fever’ would top the US charts for 8 weeks and would form part of a 15 week run where the Gibbs family dominated the US top spot. 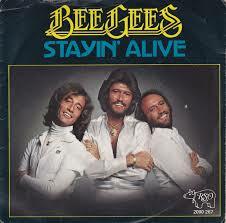 This run would start on 4 February 1978 when ‘Staying Alive’ was at number 1 for 4 weeks. Then they had a week were younger brother Andy was at 1 with ‘(Love Is) Thicker Than Water’. The 8 weeks run of ‘Night Fever’ followed and then a week of Yvonne Elliman’s ‘If I Can’t Have You’ which The Bee Gees wrote and which also appeared on the ‘Saturday Night Fever’ soundtrack. Elsewhere ‘Night Fever’ would top the charts in Brazil, Canada, Ireland, Spain and the UK (spending 2 weeks at top there). It would also go top 10 in Australia, Austria, Belgium, China, Finland, Germany, Italy, Japan, Mexico, Holland, New Zealand, Norway, Sweden and Switzerland. The other new entry was by a band hailing from Liverpool and going under the name Supercharge. Their song ‘I Think I’m Gonna Fall (In Love)’ clocked up a 5th hit for Robert John ‘Mutt’ Lange as a song writer. He would also produce the track which managed to climb to 13 on the charts in Australia. It was released on Richard Branson’s Virgin record label which was 6 years old at the time. Clive Risko celebrated reaching the 20 weeks in the chart mark. He was the 56th local act to manage this. Neil Diamond, meanwhile, moved on to 108 weeks which moved him 1 ahead of Barbara Ray. He was now in 11th place on his own on the weeks count list while Barbra Ray dropped into 12th spot. Barbara was the highest placed local act on this list. With ‘Night Fever’ entering the charts, we now had 7 songs which had made it to number 1 in the UK and/or the US (‘Stayin’ Alive’, ‘How Deep is Your Love’, ‘Mull Of Kintyre’, ‘You Light Up My Life’, ‘Take A Chance On Me’, ‘Figaro’, ‘Night Fever’) and it had been 59 weeks since this count had been this high. A quirky thing to note with this week’s top 20 was that the bottom 2 song titles ended in ‘Fell In Love’ and ‘Fall in Love’. This entry was posted in 1978 and tagged Bee Gees, SA Top 20, South Africa, Springbok Radio, Stayin' Alive. Bookmark the permalink.